The first week of VeganMoFo is already over (at least for me, I’ll take a break from blogging over the weekend). Thank you all for visiting my blog, it was fantastic to read all your comments. I have some great desserts scheduled for next week, you just have to tell me what you would like to see first: a chocolate cake with blackcurrant filling or doughnuts stuffed and frosted with butter cream? There will also be some simpler recipes and something with yeast. But for now I think I have had enough cake for this week so I want to end it with a simple and not too sweet recipe: pancakes. In Germany pancakes are not small and thick. They are large and a little bit thicker than crêpes. And we don’t eat them for breakfast. Here pancakes are made for quick and lazy lunches, especially on Fridays. Or at least that’s how it was in my family. My grandmother made them with apple sauce and sugar or sometimes even better: with canned blueberries. I never cared much for the pancakes when we had those canned berries: I would eat them straight from the jar, slurp the juice, and then show the blue lips and blue tongue I had acquired to my mother. It was a lot of fun. In a large bowl combine flours, sugar, salt, soy milk and oil. Whisk until no lumps are left and let the batter rest for 30 minutes. Add oil to a large pan and set the heat to medium. Whisk baking powder and water into the batter and use a ladle to pour into the pan. Tilt the pan so the batter spreads evenly. You want the pancake as thin as possible, but thicker than a crêpe. Fry for 1 or 2 minutes. When the edges start to brown but the centre is still a bit wet, flip pancake and bake the other side, also for 1-2 minutes. 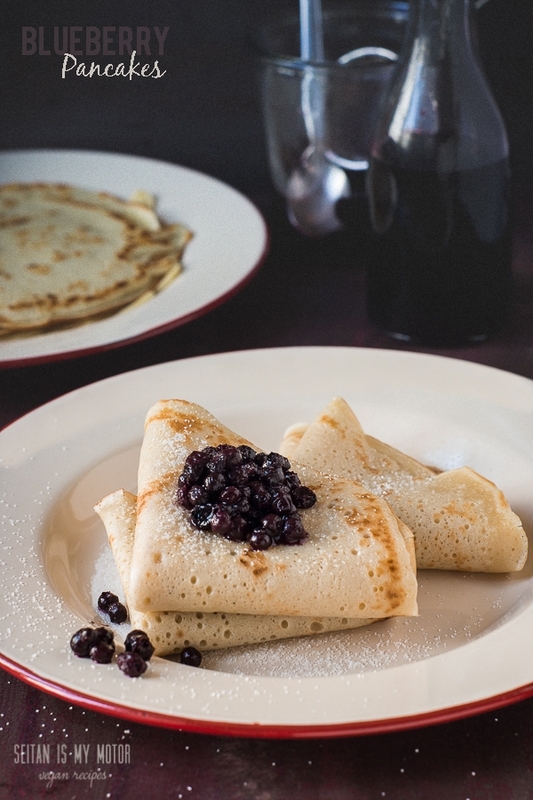 Serve with canned blueberries and sugar. Could I substitute almond milk or rice milk for the soy milk? I’m dealing with a soy allergy. Your blog always gives me serious cravings! These look lovely. Those look so good!! That’s interesting, I never knew about German pancakes, they seem to a little in between English pancakes and American ones. Oh my goodness these looking amazing! I will have these this week!! Thanks for a great recipe and happy first week of Vegan Mo-fo! I just made these for breakfast. They were fantastic. We love any and all types of pancakes so it’s great to have a new recipe to try. I didn’t have any applesauce or canned blueberries so we had some with blueberry jam and some with fresh strawberries cooked into a syrup. A great breakfast, thanks Mihl! That’s fantastic, Mia. Thanks for letting me know! You’re welcome Mihl. Thanks for sharing your recipes. P.S. I vote for chocolate cake! mmm. these look like pancake perfection. I really like the idea of a pancake that’s halfway between an American thick pancake and a thin crepe. Yours looks like the best of both worlds. And the bloobs look delicious… though I’d probably go with applesauce since I still have homemade applesauce left over from last year – and our apples are almost ripe again for this year! I can’t wait to try these. I love chickpea flour! I love pancakes! This kind looks very similar to the kind we make to eat on pancake day in the UK except we just use sugar & lemon as our topping. Those pancakes look great! Typical Dutch pancakes (pannenkoeken) are very similar. I like to make mine with a little chickpea flour, just like you do, but I don’t add sugar or baking powder to the batter. In the Netherlands we even have dedicated pancake restaurants where you can have all kinds of baked on toppings for your pancake, similar to pizza toppings at a pizzeria, but both sweet and savory. They are often willing to make vegan pancakes if you ask in advance. Apple pancakes are my favorite. Chocolate cake or buttercream frosted doughnuts? Yes to both! !